Podcasts are a fantastic way to turn a painstaking commute into morning coffee time with an expert. Or, if you don’t feel like reading before bed, you can simply relax and let the information flow. Either way, podcast listening is perfect for busy people who still want to keep learning. If you own or work at a small business, these are the podcasts you should be listening to. Hosted by bestselling author, Daniel Pink, this podcast bursts at the seams with fascinating stories and tips from successful authors and entrepreneurs. Similar to The Tim Ferris show, Pink invites guests onto his monthly show to share their stories and advice. Oh, and Pink happens to be pretty smart too. His TED Talk, the puzzle of motivation, is one of the top ten most-viewed TED Talks ever. John Lee Dumas has done more than 1700 interviews for Entrepreneur on FIRE (EOF). How’d he rack up that many? By publishing seven days a week. The show is situated around three prompts that each guest entrepreneur responds to. The first: What is the worst entrepreneurial moment you’ve been a part of? The next: What are your favorite “AH-HA” moments? The last: What are you most ‘FIRED’ up about? 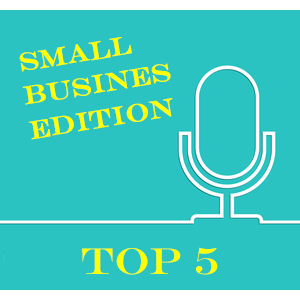 With a slightly more humorous approach, hosts Andrew Lock and Chris Farrell put on a weekly web TV show that’s all about helping small business owners and entrepreneurs. More specifically, they discuss marketing strategies, tips, and practices. If you read the reviews on their website, you’ll notice one of the overarching themes is that by listening to this podcast, people are learning how to do more with less. A staple among all business radio shows, Jim Blasingame’s show has been on the air since 1997. The weekday podcast is completely devoted to small business advice. Today’s episode was particularly interesting as it focused on the power of storytelling as a way to communicate ideas. If you want classic, practical business advice, this podcast might be for you. This podcast covers the broadest range of topics in order to provide helpful tips to a wide range of people. Chris Ducker’s specialty, though, is personal branding. Ducker has been featured in Entrepreneur, Forbes, and Huffington Post, where he has been cited as an expert on becoming a “Virtual CEO.” For more information on his story, click here. To listen on your iPhone, simply download the Podcasts app and then search the names of these podcasts. To listen on your Android phone, be sure to download the Stitcher app in Google Play. For listening on your computer, just click the title of the podcast.